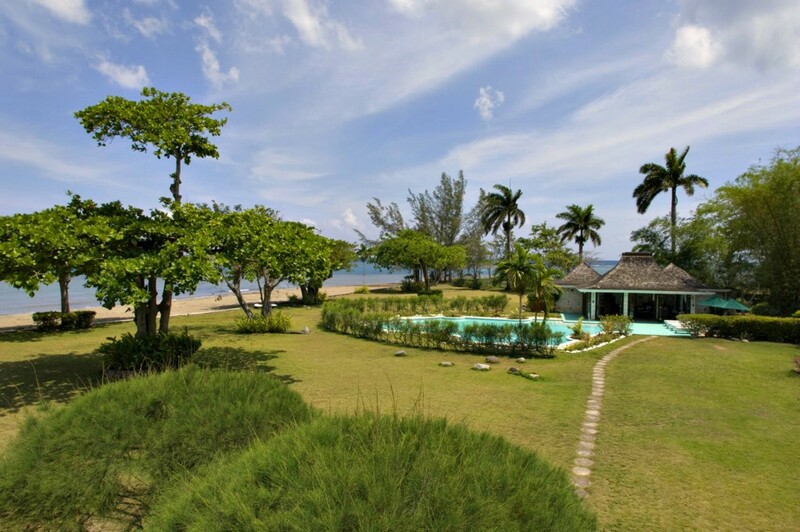 Welcome to Noble House on the Beach, a luxurious 5 bedroom beach front villa located in the beautiful Montego Bay. 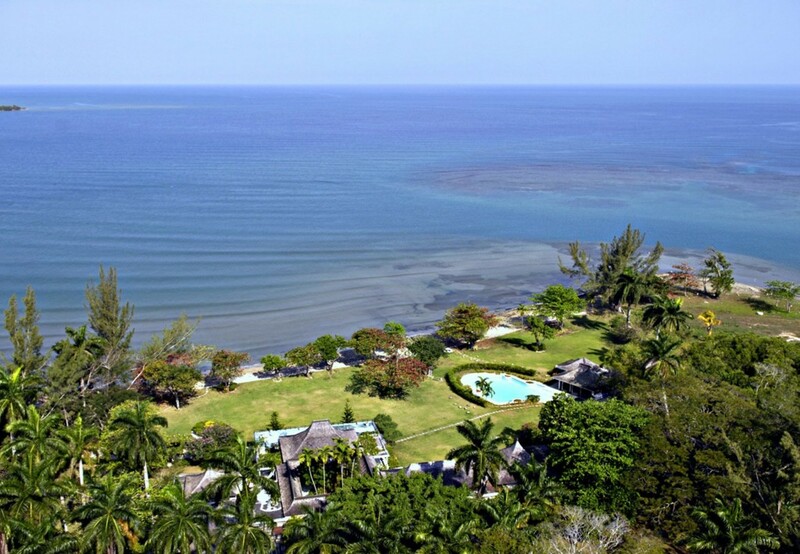 Noble House is perched on one of the most coveted sites on Jamaica's lush north coast. This iconic villa is a unique, sprawling 15,000-square-foot private home. 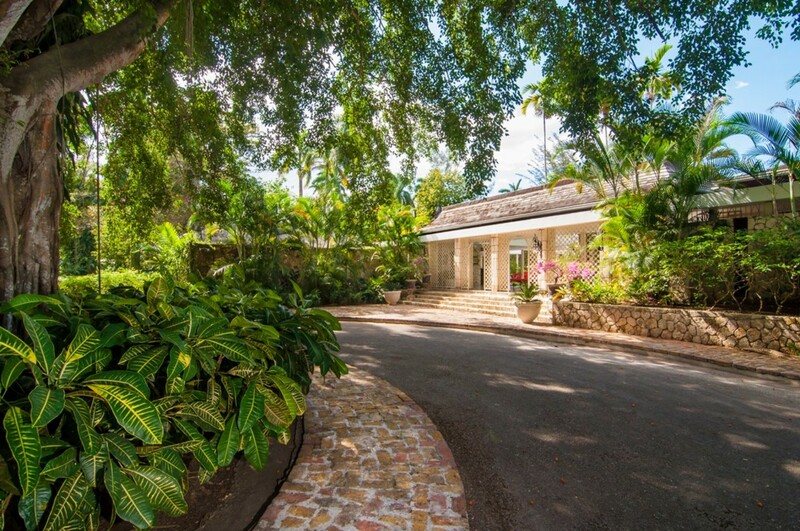 Noble House is a unique combination of Caribbean and Oriental elegance. 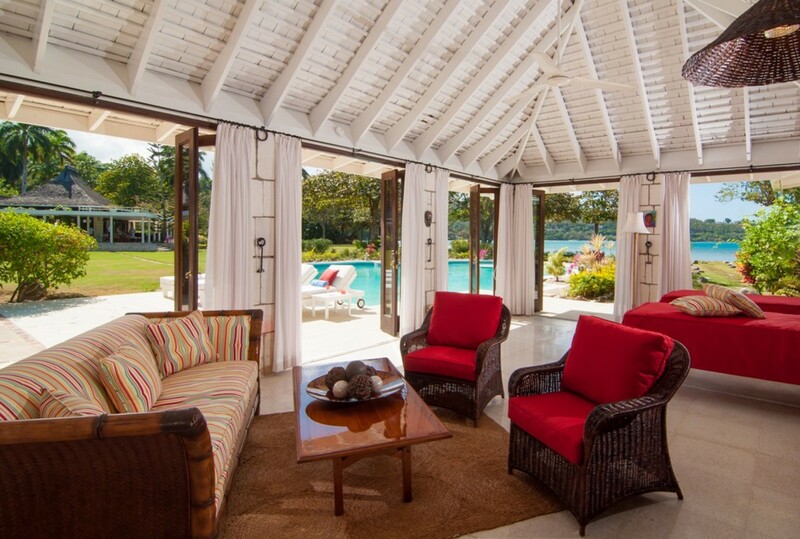 The architecture in this Jamaican villa is immaculately tasteful consisting of airy pavilions with peaked roofs and its living spaces separated by water gardens and bridges. Noble House is simply a paradigm of beauty and style. 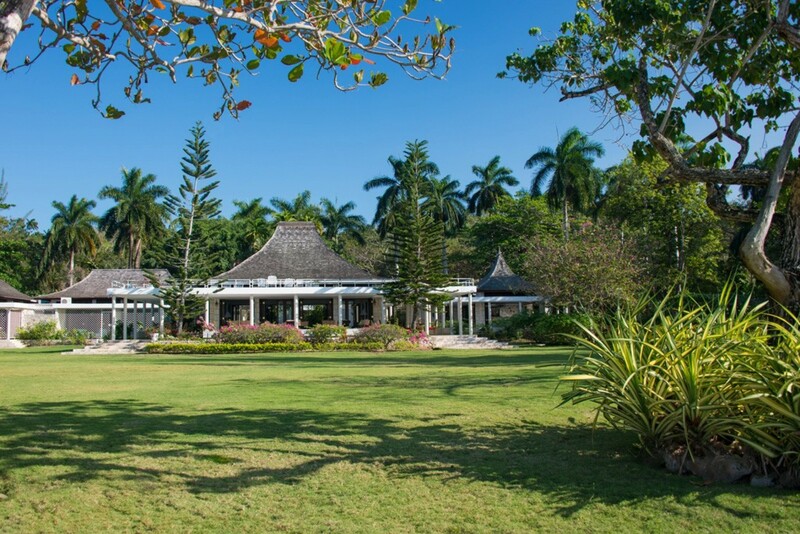 The 600-square-foot main pavilion consists of the Great Room with 56 glass doors and massive wrap-around veranda on floors of gleaming white Jamaican marble. 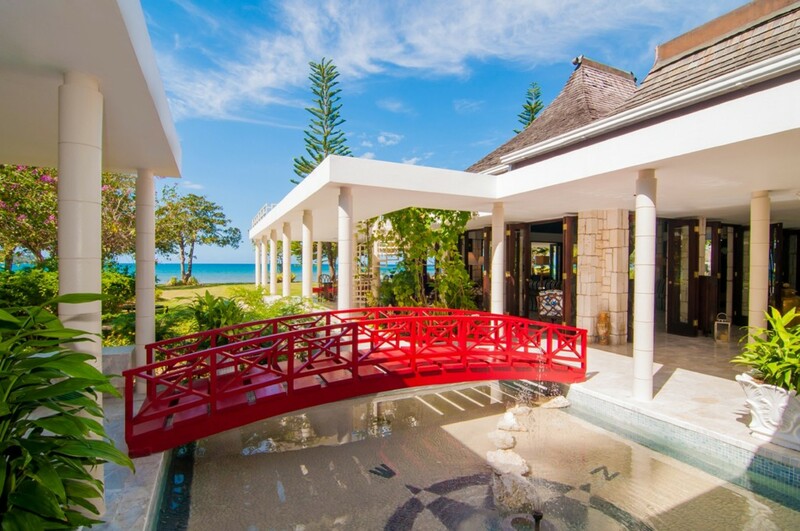 Outside the Great Room, a Japanese footbridge arches over a reflecting pool to the formal dining room. Like the Great Room, the dining room has wrap-around glass doors that open to the mesmerizing landscape of gardens and ocean view. 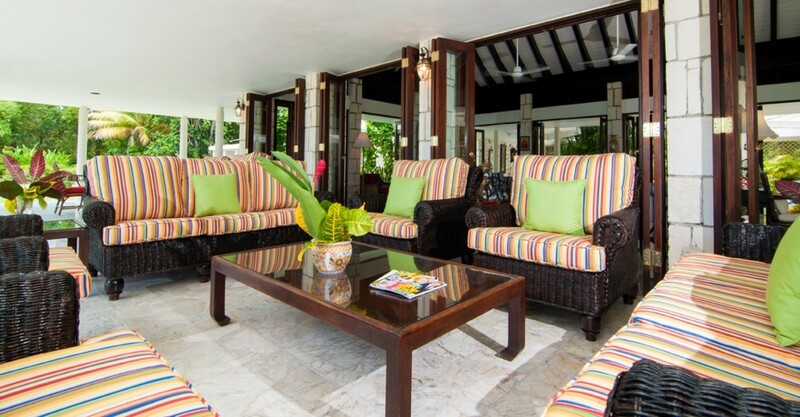 Everyone's favourite gathering place is the veranda generously furnished with deep comfy chairs and sofas, dining tables, nearby bar and cable television. 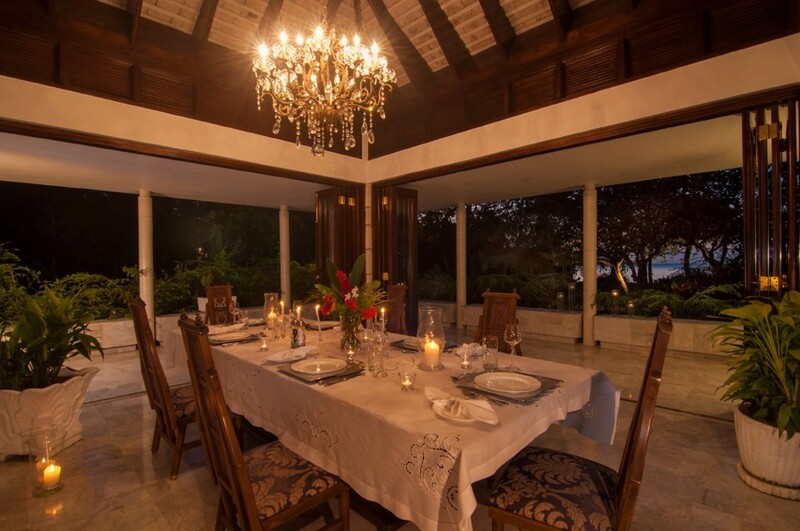 On this spacious veranda, breakfasts, lunches and candlelight dinners are served where memorable meals are created by Chef Jerome and served by our good Butler Rodrick. Steal away across the soft lawn for a solitary escape. 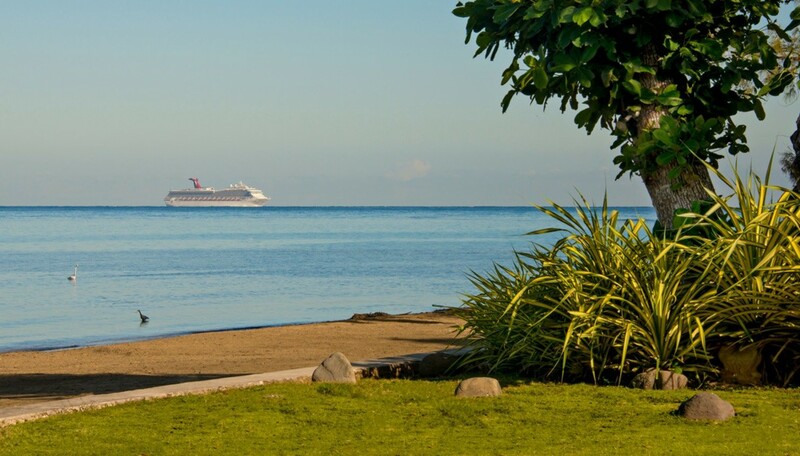 Take a nap and read a book in the shade and wave at a cruise ship full of passengers who wish they were where you are. 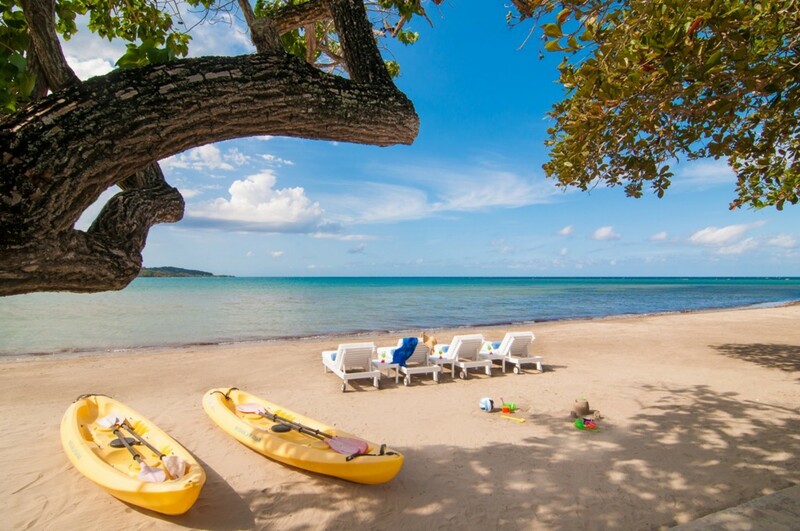 Outside you will find a well-kept lawn dotted with gardens and a soft sand beach where you will find complimentary kayaks. 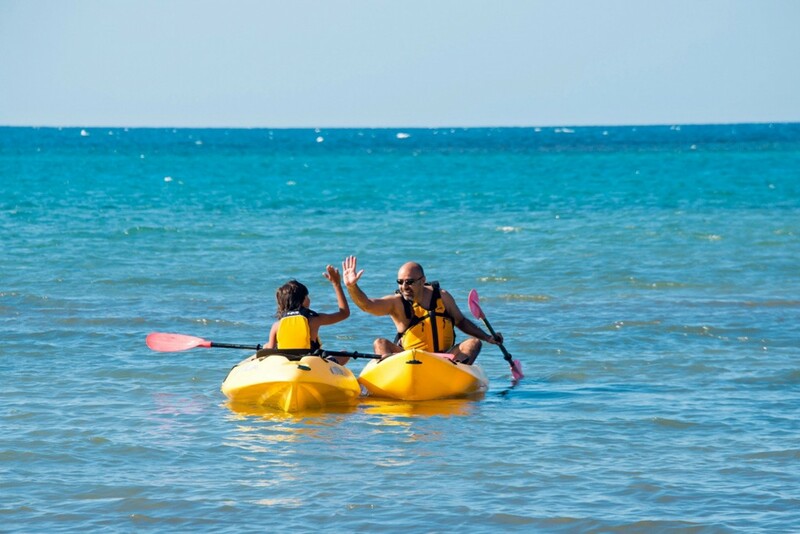 The gentle surf makes it easy for parents and kids alike to paddle and play as much desired. Many memorable moments will be made here. The sprawling grounds are like both a park and a playing field. 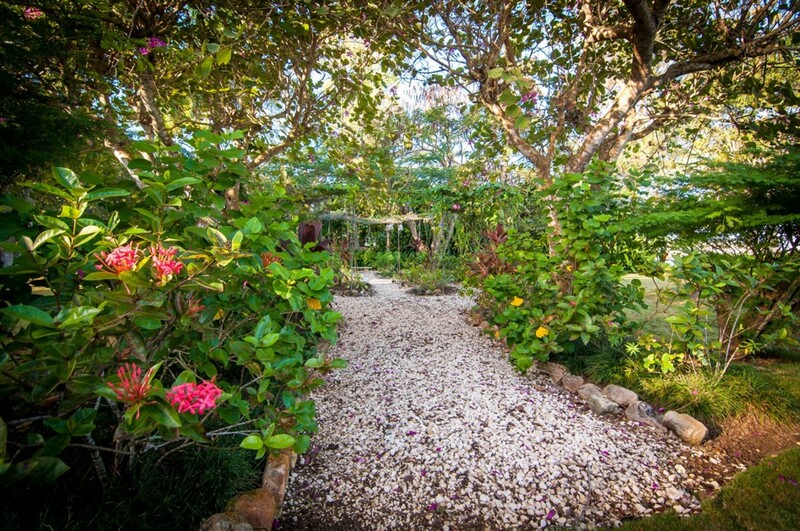 The gardens include a wild orchid tree, herb garden, two mango trees, one lime tree and a beautiful breadfruit tree. The wide lawns are home to croquet, badminton and volleyball. 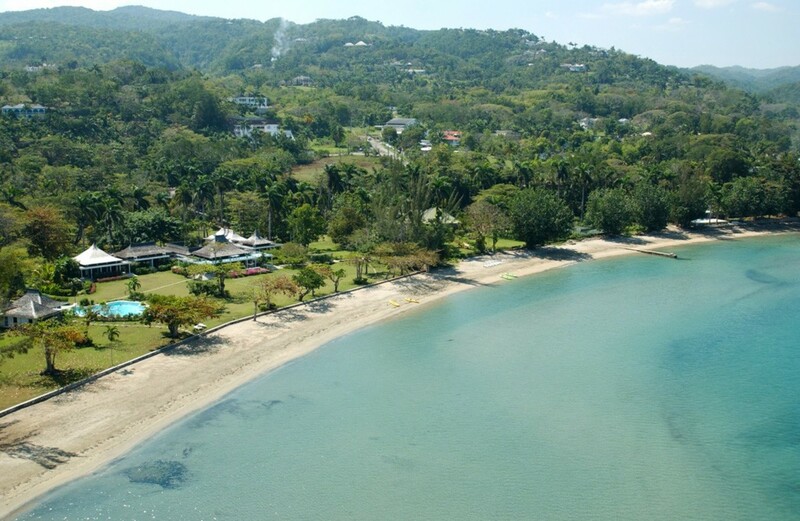 100 yards offshore is Holden's Reef, a continuation of the barrier reef complex that fronts much of Jamaica's north coast. Easily reachable by kayak, this live reef is home to a myriad of tropical fish and corals. At low tide, portions protrude above the water so you can step from your kayak to snorkel in shallow water. 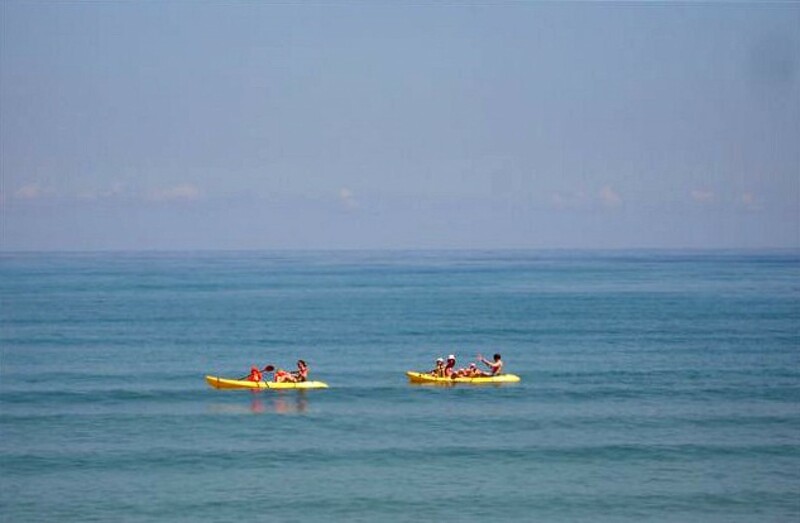 On the ocean side, deeper waters beckon the more adventurous or scuba equipped. 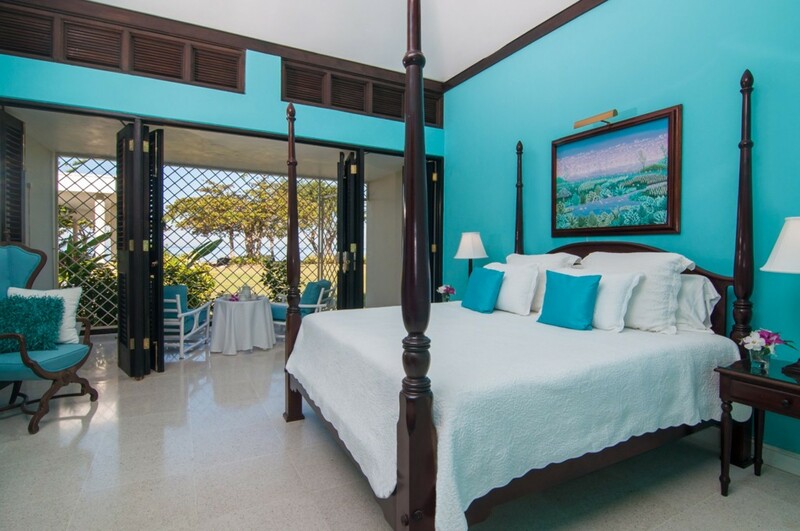 You will have the perfect start to each of your days in The Master bedroom at Noble House that opens out to its own spacious porch where you will wake to the aroma of eye-opener Jamaican coffee, quietly placed there by our butler. 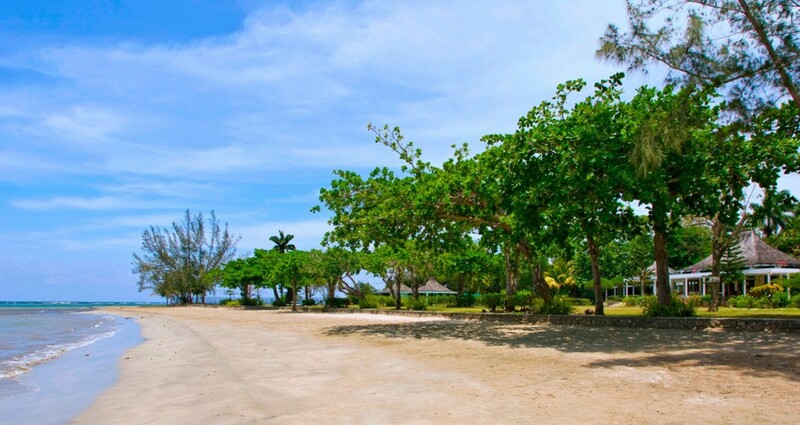 After you have had your delicious full breakfast, you might enjoy a walk east on the beach for your morning exercise. Take a swim in the sun. 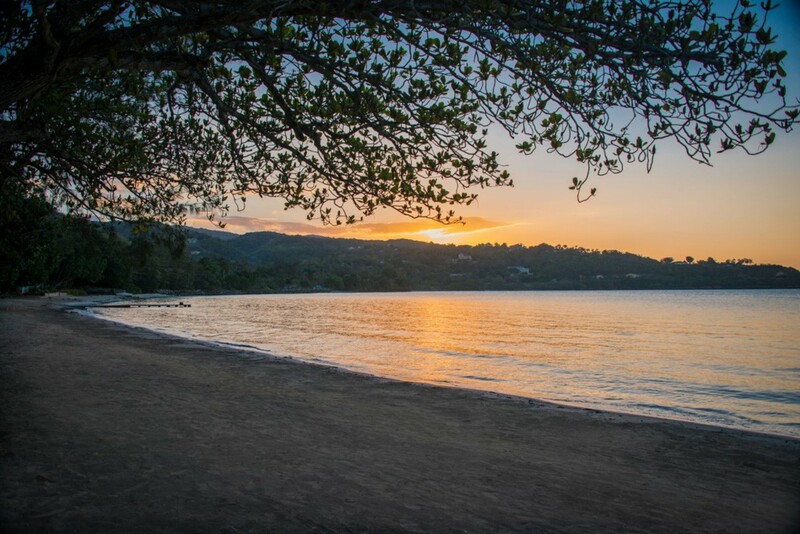 Take a moment at the point to gaze eight miles across the sea to the town of Montego Bay, stunning when lit after dusk. 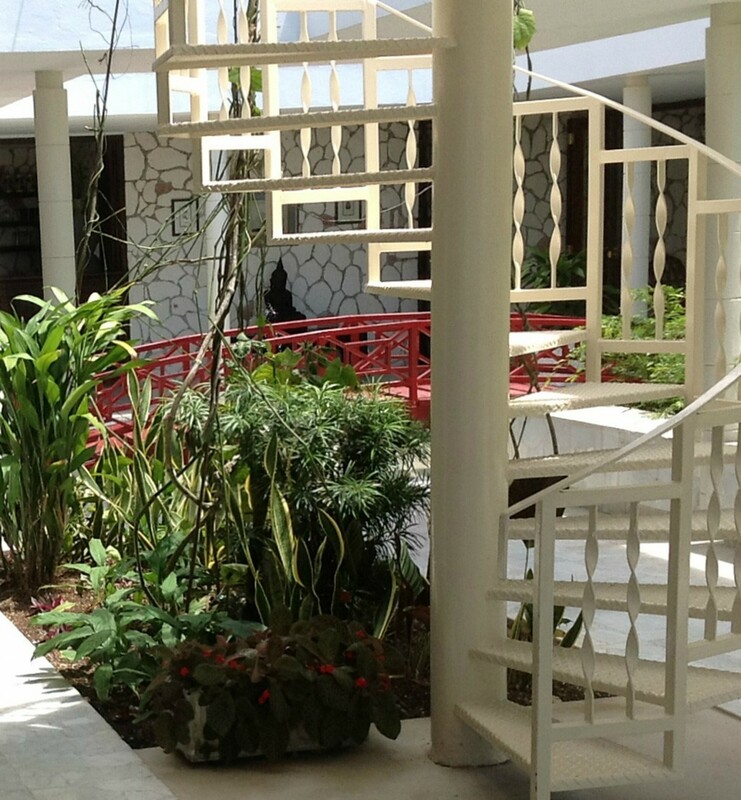 Stroll back to the villa and grab a cold drink, then take the spiral staircase to the roof deck for a more elevated view of Montego Bay. On a quiet night, the sound of waves lapping on the beach may lull you to sleep. 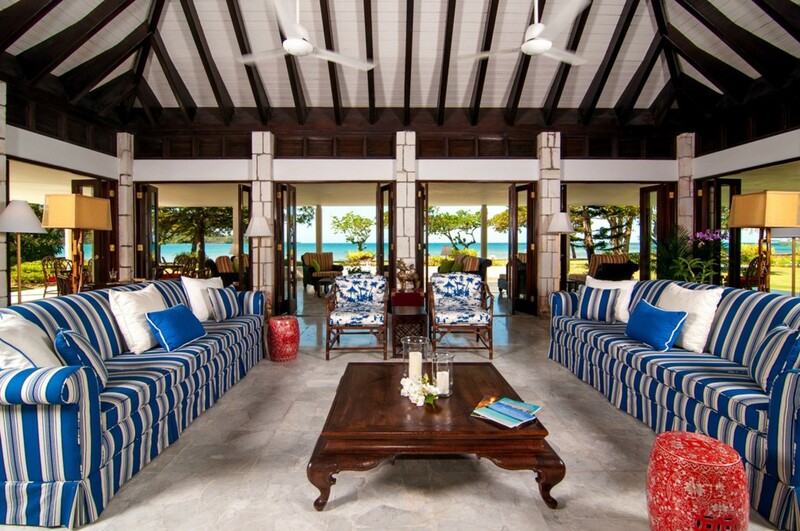 Noble House shares eight acres on the sea with deluxe neighbouring villas Serenity and Tranquillity on the Beach. Combining these 3 homes creates a 15-bedroom compound with 3 pools, 1 tennis court, 1 basketball hoop, long beachfront and staff of 19. This remarkable waterfront trio is a favourite for family reunions. 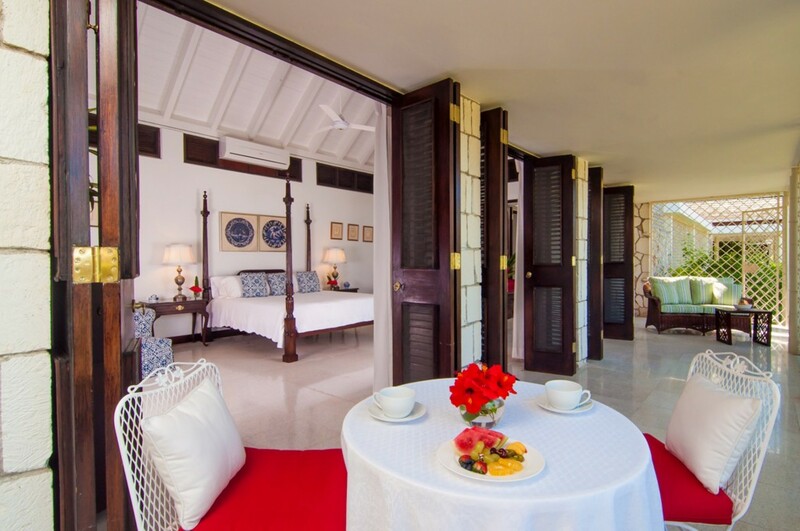 All 3 villas are very private from each other, extremely family friendly and welcome children. While staying here why not venture out into the local areas and try some of our recommended best things to do in Jamacia! STAFF While staying at Noble House you will be personally looked after by our wonderful team of staff. 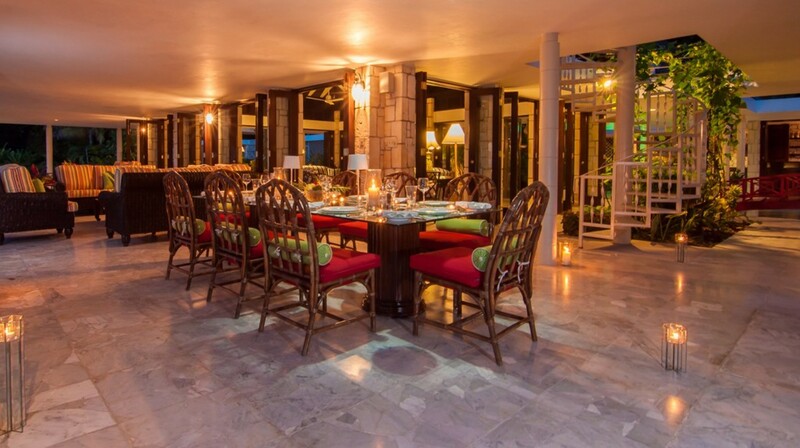 Everyone craves the extraordinary food and service that come with a villa vacation. 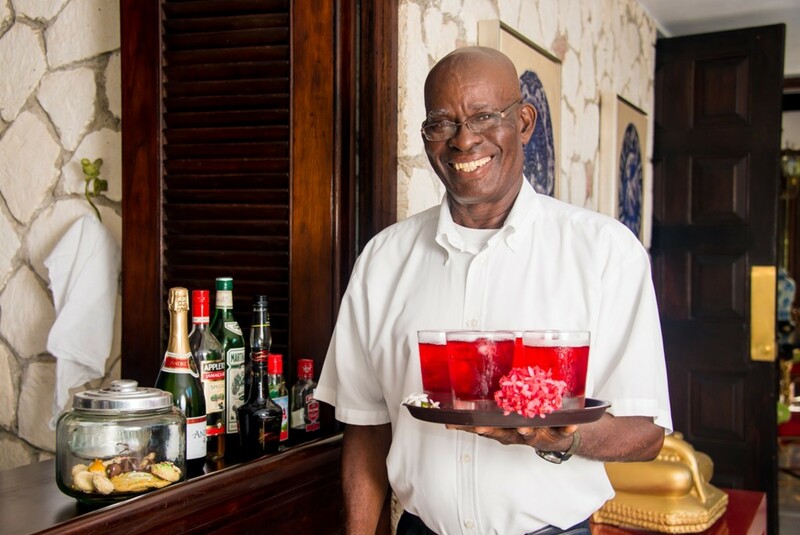 Your arrival starts with a welcome drink offered by longtime butler, Rodrick. Many more drinks to come. 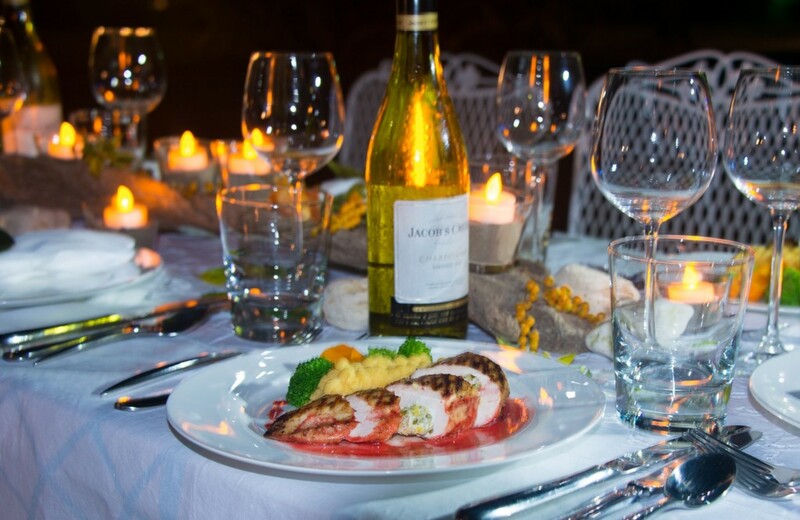 Talented Chef Jerome artfully presents meals as attractive as they are delicious. 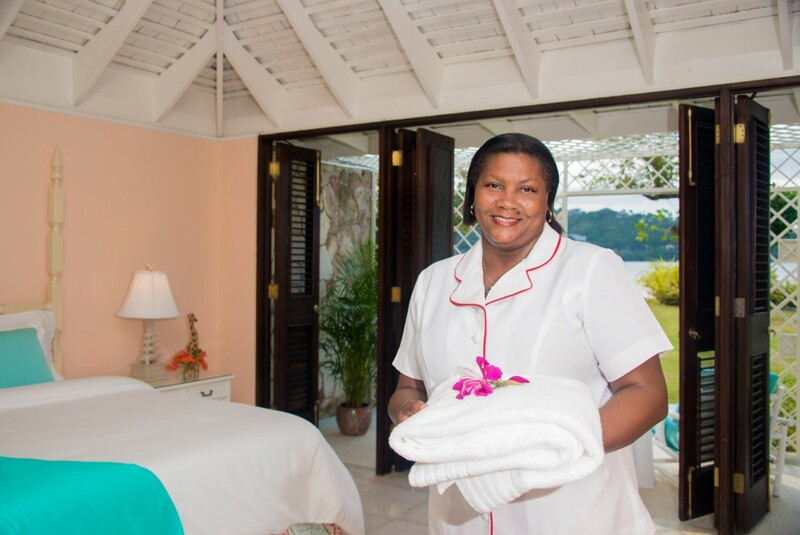 The housekeeping team headed by Ionie looks after your bedroom and bathroom, lamps, linens and laundry, and ensures fluffy towels for bath and beach. The welcoming staff will offer cold drinks, chilled towels and warm handshakes. You'll never touch your luggage -- they'll handle everything for you, pampering without ever intruding. Televisions are in all bedrooms and on the veranda. Kingsize bed, 3 walls of louvered mahogany doors, private veranda, television, his `n` hers bathrooms, one featuring a 7-foot circular sunken marble tub and shower. 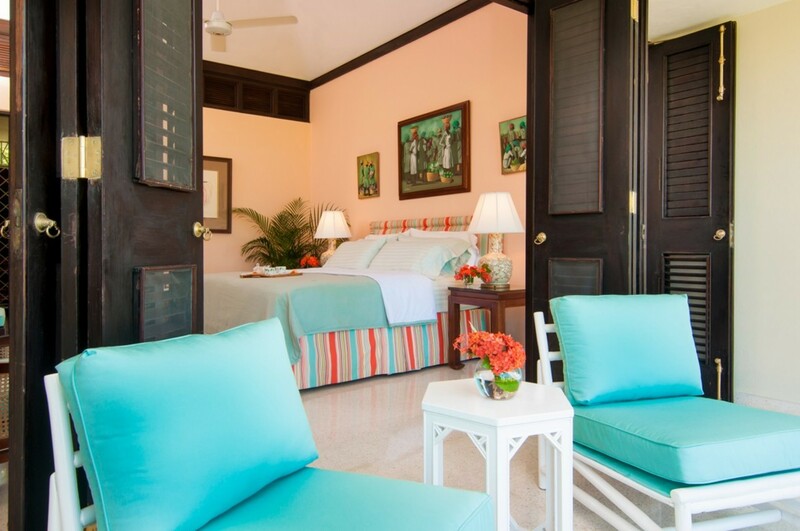 Kingsize beds, louvered mahogany doors opening to private porches, en-suite baths and sunken tub/shower combinations. Air-conditioned Pool Cottage includes living room, wet bar, television and curtained French doors to the pool terrace. Large bedroom, kingsize bed, en-suite bathroom and small sea-facing patio. The living room doubles as a semi-private bedroom loved by toddlers and teens. This room has its own full bathroom with shower. 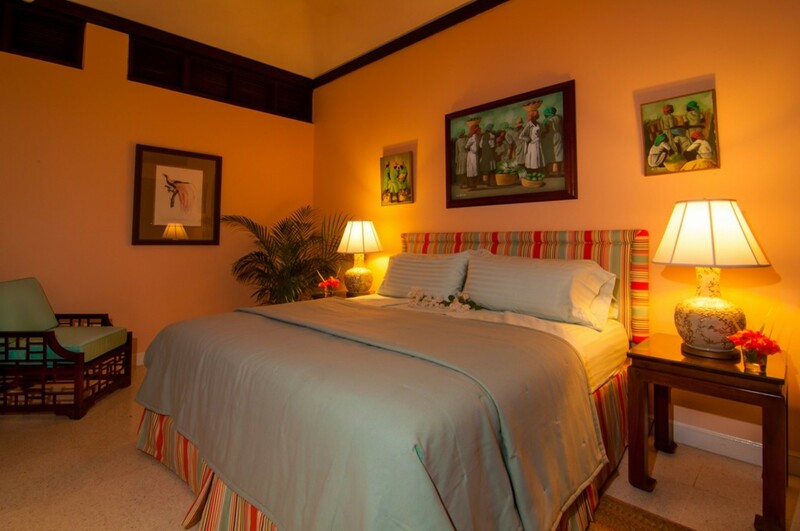 Its twin beds can accommodate two additional guests bringing total sleeping accommodations in Noble House to ten. 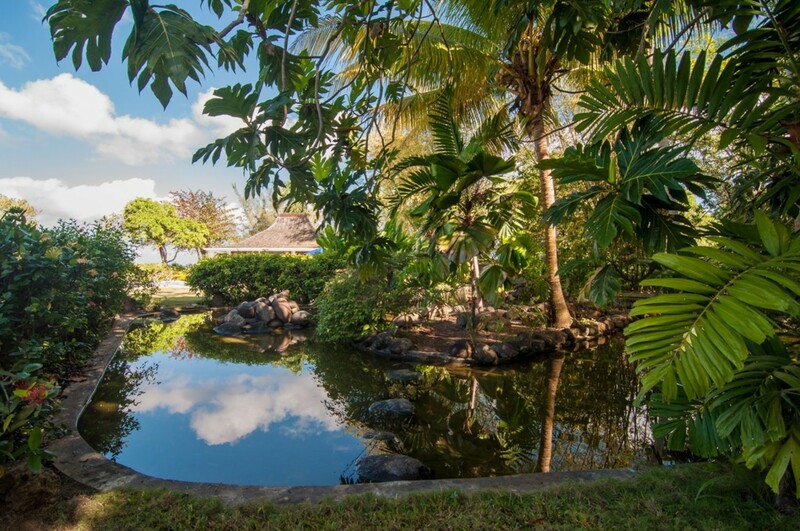 • 10,000 Interior Square Ft.
• Children Welcome - Wonderful big soft lawn, sandy beach and shallow entrance to the sea, Pack n Play -- excellent for children. 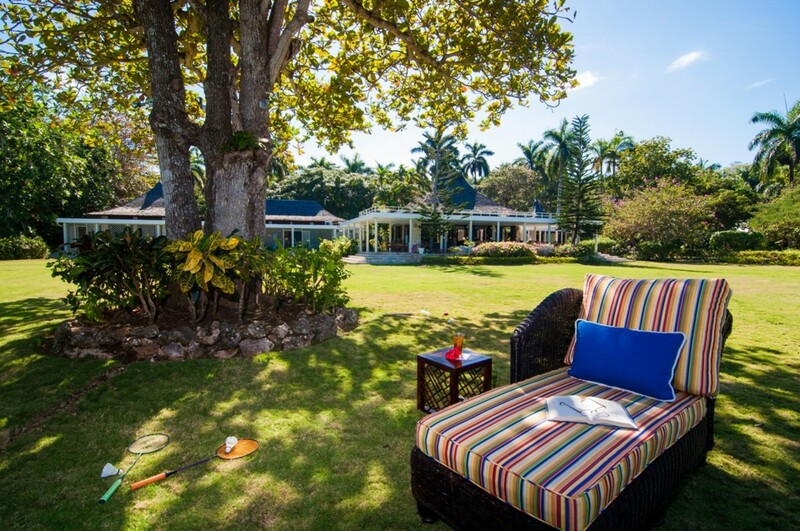 For a great write-up of the Tryall Club, see Dana Vachon's article Club Jamaica in Departures Magazine. Hi Emma & Noreen, Thanks so much for coordinating this awesome vacation for our families. The setting was incredible- from the large lawn to play volleyball and badmitten to the pool area to the beach! The staff made us feel like family. They played games with us and just "hung out". It's rare that our boys connect so quickly with people. This is a testament to their warmth- Hurga and Ionie are the best! One member of our party has food allergies. It was so comforting to know that Jerome was aware and able to accommodate him without any bother at all. The food was healthy and delicious! We hope to work with you again for "same time next year" but with a new location. 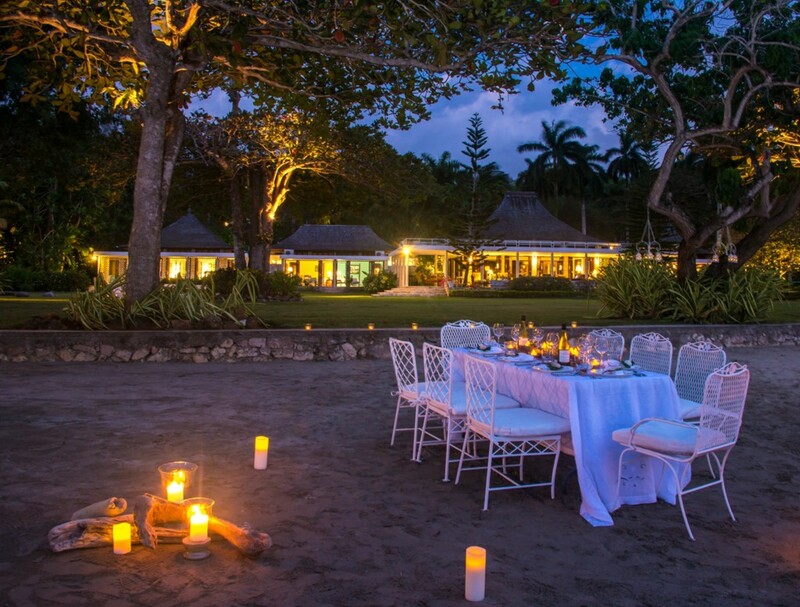 We are thinking about Barbados, Anguilla or St. Lucia. I know we can't replicate this house or experience! The only thing missing was the sunset and white sand beach and a hot tub for soaking in after playing lawn games! Thanks again and Happy New Year to you. We loved everyone and had a great time. Hi Emma, Jerome’s food was amazing & I’m a picky eater so that says a lot! Also, Iodine was WONDERFUL!!! We loved everyone and had a great time. Hope to visit again with my family for the holidays. Hi Emma & Noreen, Thank you, it has been really nice! Beautiful, Relaxing, and the staff were out of this world, from the time we got out of the car , we felt like they were family , I will truly miss them all!!!! They made the Noble house perfect. We had an amazing time at Noble House! Hi Emma, the trip was flawless—and the staff at Noble House could not have been better. So kind to both sets of parents, but, in particular, my father who needs the extra attention these days. Really a lovely setting but that much lovelier because of the staff. Thanks to you and Noreen for helping me with all the arrangements in advance. Our stay was a fairy tale indeed! The Noble House and our stay was a fairy tale indeed. The staff made us feel like family from the day we arrived until we left. We were lulled to sleep at night by the sounds of tree frogs and woke up to fresh fruit, coffee, and breakfast on the patio daily. The grounds and the house were spectacular - just as described! Our sail with Carolyn was perfect and she made us feel special. I cried when we arrived and cried harder when we left. We plan to go back next year. Thanks so much to you Noreen and Emma for making everything easy for us. Wonderfull experience, the staff quickly become part of your family. Rodderick is the man. The pre trip planning was painless & professional. Highly recommended. We had an awesome time! The villa is in excellent condition. There were recent renovations done prior to our arrival. We had a total of 6 people (3 couples) in our party. The staff was excellent. Jerome is an excellent chef. Roderick, the butler, made sure our every need was met. Niguel, our driver, was an awesome tour guide and gave us great recommendations for our day trips. I definitely recommend making a day trip to Negril at some point during your stay. This is an excellent choice for groups to go relax. Definitely would consider going back to Noble House. Nice staff, beautiful house, good food. It was one of our best trips ever. Hi Emma, Noble house was absolutely amazing! The staff were all wonderful and the food was delicious. Everything went better than planned with the help of Nigel. We had a few extra outings and a lot of fun. It was one of our best trips ever. Thank you and Noreen for making it so! Top notch service from everyone! The beds were amazing, the furnishings gorgeous & gracious and the grounds exceptionally beautiful. All of us absolutely loved the trip. Emma, We had an amazing time. The house was perfect; the staff was an absolute pleasure; the excursions and band were a great time. All of the families spoke about it, and we would all do this again. If we decide to mix it up next year and try a different place, it will not be because it could have been any better of a time than we had at the Noble house. All of us absolutely loved the trip. 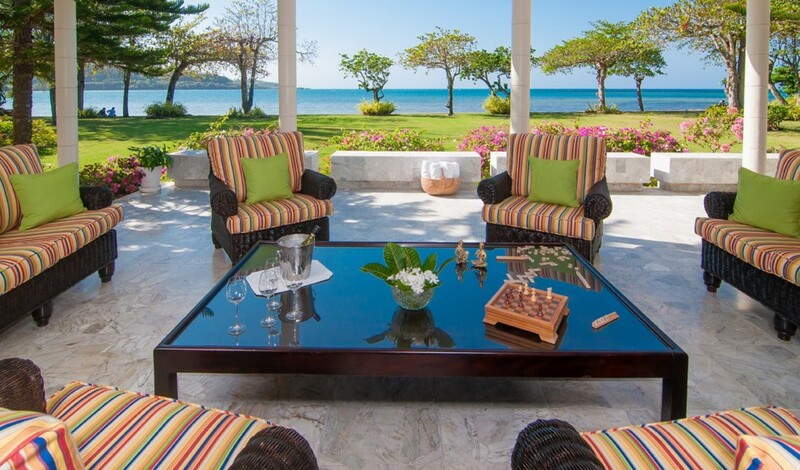 Noble House is a beautiful villa in a great location. But the staff take the villa to another level. Chef Jerome is always busy creating amazing dishes. The housekeeping ladies are just so friendly and helpful...and then you have Roderick, the amazing butler! He does not miss a thing. I can guarantee you he will look after guests so well as he was just amazing when I was here. 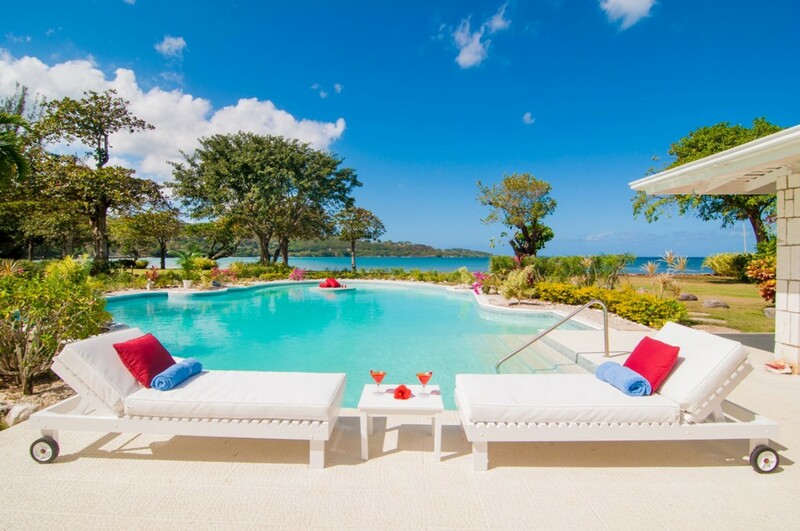 Noble House is by far one of the nicest villas in Jamaica. It has the advantage of being right on the beach which is perfectly calm and in during most times per year you can swim here. 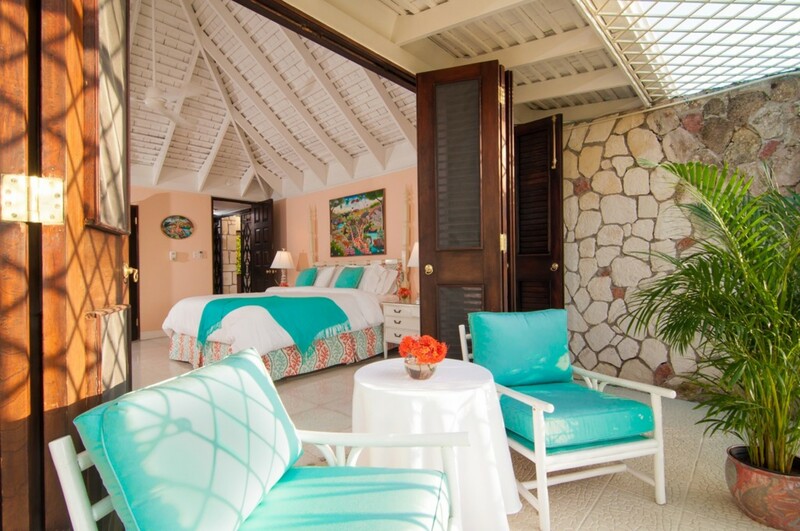 I have the opportunity to stay at the wonderful Noble House on my most recent trip to Jamaica. The staff were simply amazing. Roderick the Butler is second to none and will look after your every need. Jerome the chef prepared some of the best food we had in Jamaica. Our first nights dinner including Pumpkin Soup, followed by Chicken With Callaloo and topped off by a Jamaican Chocolate Cake! It was to die for. There are 5 bedrooms here - 3 in the main house and 2 in the guest cottage. The guests cottage is suitable for a smaller family as the rooms interconnect. Although the bathrooms are a little dated the bedrooms are really comfy. For added peace of mind there is a night watchman included in the villa. 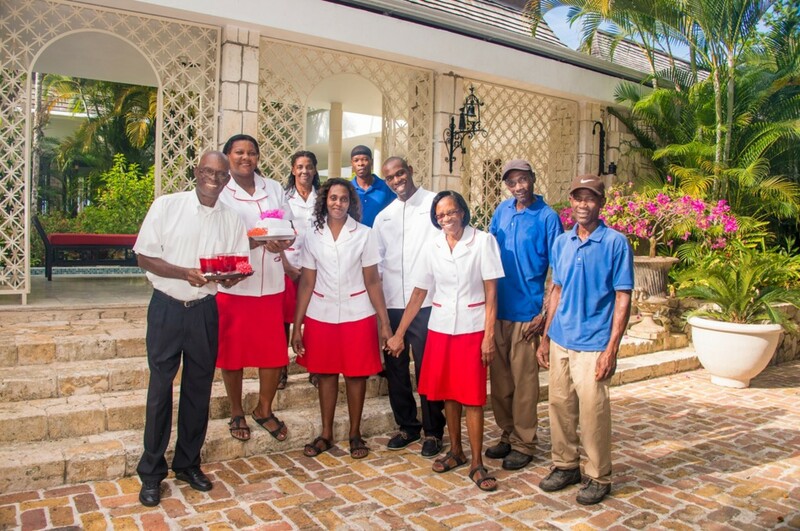 The staff of 9 will ensure you have the best vacation ever. I had such a wonderful time at Noble House. The location and staff are fabulous...and the talented Chef Jerome will never let down your taste buds! 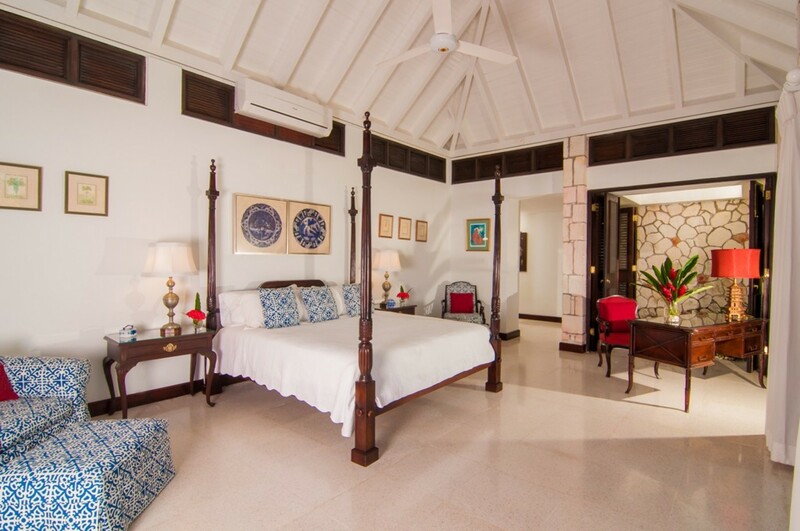 All guests at Noble House are in for an unforgettable experience with family and friends.